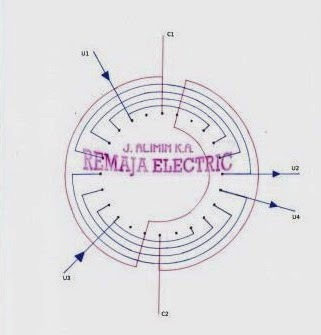 Engine production units that use induction motors are sometimes needed to be using an ac motor can rotate forward and backward so that it takes a tool that can set the direction of rotation of induction motors, the picture above is a picture of a circuit that works to set the direction of rotation of the motor induction 3 phase, be it in the position of star / wye or delta position. at the present time the conventional regulator circuit above is still widely used by the industry, both small and large industrial industries. Specifically, its use is not very important, because the production machines had been developed in terms of the use and construction of the engine itself. But in principal is the same, namely the flipping reverse the direction of rotation of induction motors. geared motor is a tool specifically designed for use on certain devices that require a low rotation speed, but has the strong torque, has a design that is tailored to the industry standard and allows for installation in a variety of positions and applications. to align the rate of rotation, the motor is used according to the requirements, it is necessary for a motor that has a slow rotation speed. Double layer winding, rotation speed 750 Rpm, 3 phase, rated frequency 50 Hz, no of pole 8, no of coil group 8, each group have 3 coil and all the coil in series connection, coil span 8, 72 slots. Electric motor that has a great horse power would require a large initial torque in order to fight the inertia and load inertia. large torque means it will require a large current consumption as well. 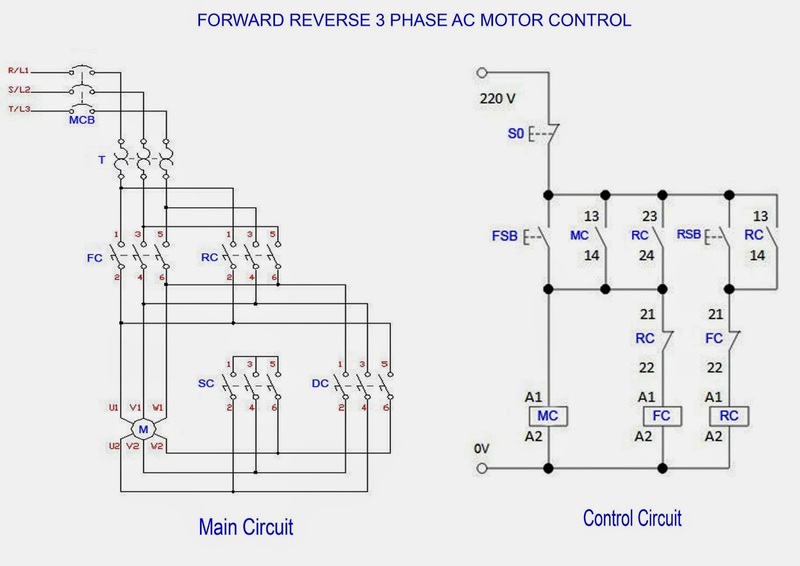 The relationship of delta or star-delta or wye-delta is at the moment still quite popular as choices for applications requiring large current consumption, to avoid excessive energy consumption, the application circuit star delta using a large current while the motor is turned on early. 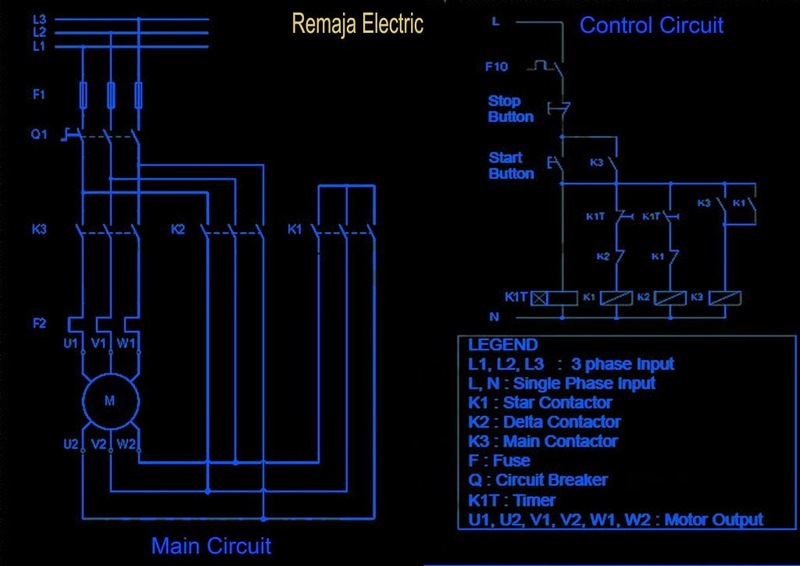 In operation, the main contactor K3 and K1 star contactor will be energized initially and then after some time the contactor will be de-energized star is replaced by a delta contactor K2. When active control contactors is regulated by a timer K1T that time can be arranged. Star and delta relations will be protected from potential active at the same time using the interlock on each contact. 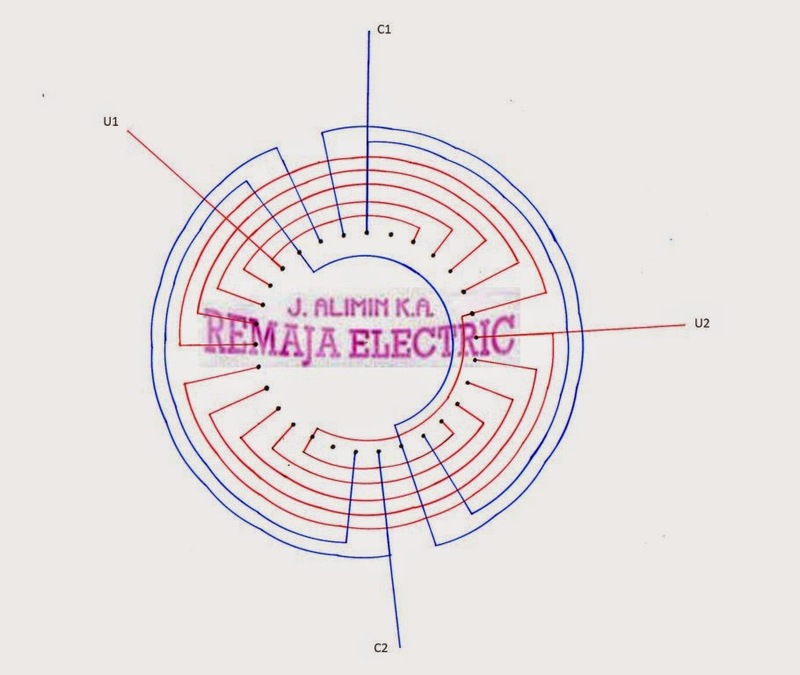 Switching connection between the coils in each phase has a significant effect on the diameter of the wire used in the electrical motor rewinding, we sometimes encounter a situation where the diameter of the wire that we have not used in accordance with the specifications or the diameter of the wire that we need are not available , then by changing the existing connections in the stator coils, either from parallel connection turned into a series connection or series of connections turned into a parallel connection or a combination of both these connections, can be an alternative solution in rewinding electric motors. Wire Diameter 0,85mm x 2, No of turns 57, Coil Span 7,9. 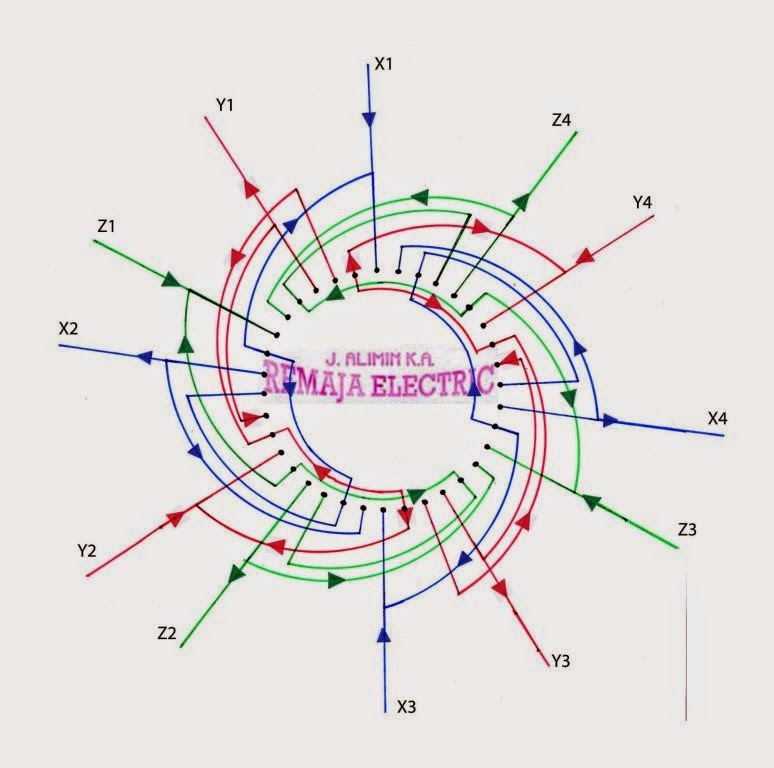 Number of poles in an electric motor will affect the speed of rotation of the motor. the fewer the number of poles located on the electric motor rotational speed will be faster and vice versa, the more the number of motor poles it will be slow. 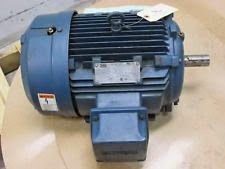 2 pole motor that has had an average speed of 3000 rpm, 4 pole 1500 rpm rotational speed, 6 poles 900 rpm rotational speed and the average speed of 8 polar rotation of 750 rpm. 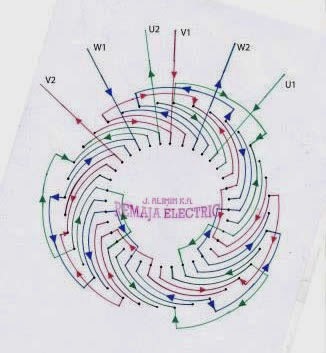 Winding diagram above is of electric motor windings which are divided into 4 groups that surrounds the stator in single layer type windings, this means the motor average rotation speed is 1500 rpm, with a total of 36 slots, each group has a different number of coils, there are 2 groups which has 2 coils and 2 other groups only had one coil, all coils are connected in series. Detailed diagram is shown by the figure below. 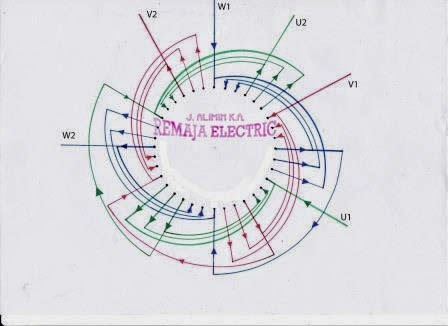 Based on " Elektrim AC Motor"
On this occasion we will describe the method to connect the motor coil using a combination of series and parallel, the diagram below looks a coil 3 phase induction motor with double layer winding having 4 poles with 36 slots, each phase has four groups that surrounds the stator coils, where each group has 3 coils. 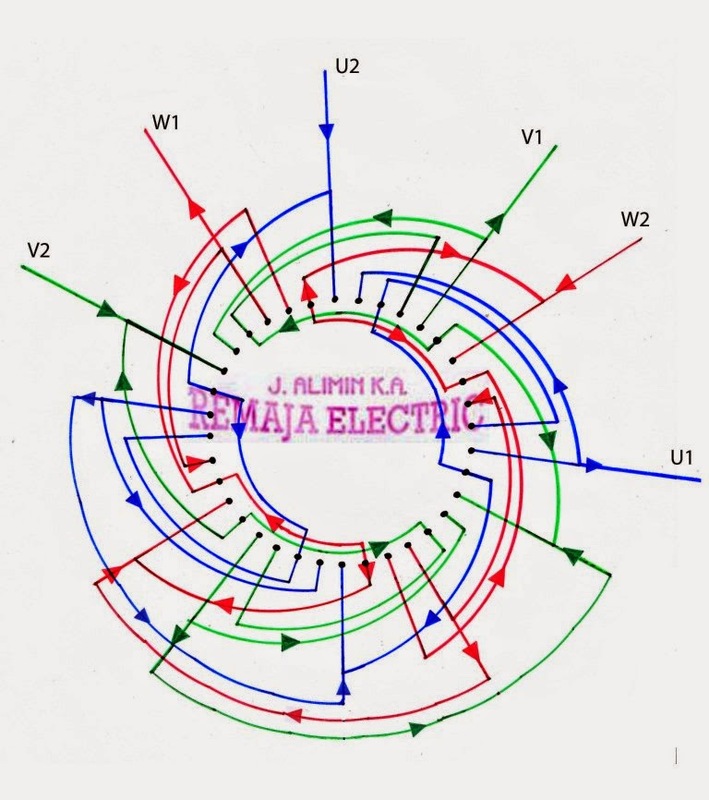 Based On " MEZ Induction Motor"
There are many kinds of ways and types to perform rewinding electric motors and is very influential in the use of wire diameter and also on the relationship between the coils, either in series or parallel or a combination of both these connections type. 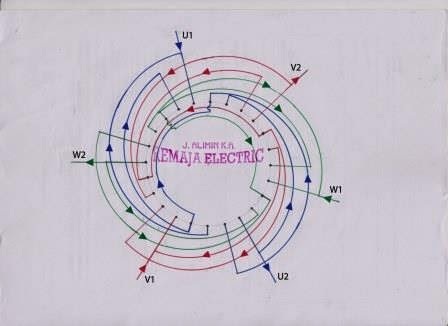 The image below shows a diagram of an electric motor in double layer windings which have a rotation speed 1500 rpm, has 4 poles and using a three-phase voltage can also be seen that each phase coil divided into 4 groups, where each group has 3 coils and all groups are connected in series. 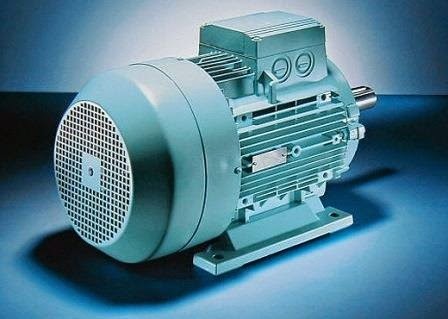 Based on "Poland Induction Motor"
Choosing the size or power generator suitable for your needs is not difficult. 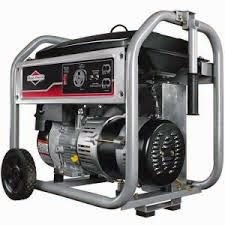 Whether you choose a generator for work, you should have a general idea of ​​how much power you need from a generator. 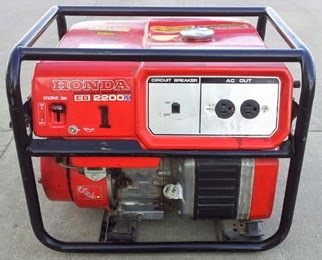 Honda Genset is suitable for household and office equipment including computers, televisions, microwaves and other electronic equipment. better. Honda generator having an excellent performance and safe for your electronic equipment. Honda is one of the best generators in the world. Honda is always there to bring the latest generator technology, this is reflected in the performance and better durability, capable of operating in a long time, quieter operation and low exhaust emissions. honda generator is suitable for home and office. Provide stable power and fuel economy. Very useful when his electrical interference, and can be used for other purposes in places that are not affordable electricity network. 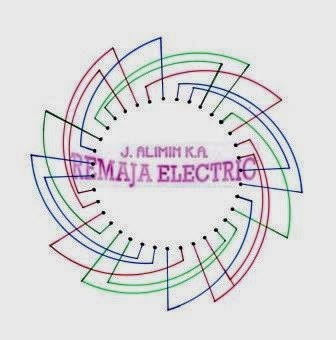 The main coil is composed of two parts, red and green, this is due to the need for the input source that will go into the AVR, AC voltage required for entry into the AVR is equal to 10 percent of the total amount of electricity generated voltage as a whole. 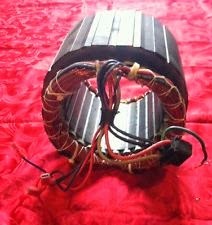 The two coils are connected in series (U2+U3) so that the total number of coils will generate a voltage of 220 volts. in industrial world, electric water pump is an important equipment and it is very vital to support the p production process, therefore, the water pump will be very easy to be found, not only in the industry but also in almost every house because water is a basic requirement for human life. 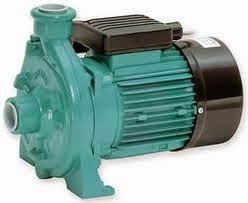 electric water pump is a combination of an electric motors with a mechanical pump. 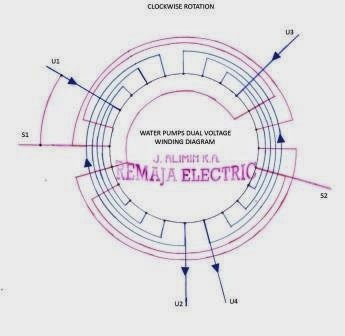 on this occasion I will present a winding diagram of electric water pump with dual voltage. 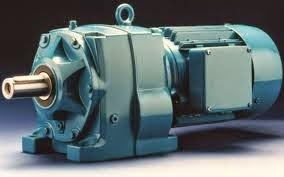 an electric pump have 3000 rpm rotation speed with many type and kind. This portable generator will pack Ensure trouble free holidaying, camping, caravanning, boating and 4WDriving when you need it. AC motor with slow rotation are custom and designed and made for special order by customers for specific application, the motors flexibility design are made for high operating efficiencies, use high grade electric-magnetic steel lamination and have excellent corrosion resistance.motors are widely used in multitude industries such as mining, chemical and petrochemical industries, steel industries, pulp and paper etc. 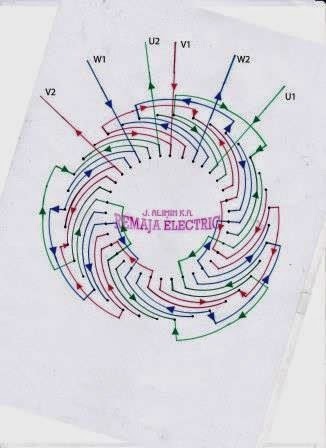 According to the diagram inside, that the winding have six pole, that mean the rotation speed is 900 rpm, each phase divided to six group and every group have two coils, all the coils are in series connection. 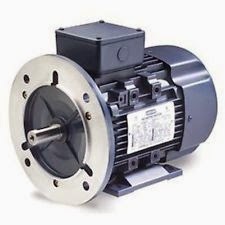 No modern industry should be without one or maybe dozen that used an induction motor. the design allows for easy maintenance, use special cast iron body. for the speed 1500 rpm typical applications include water pumps, air compressors or for transporters, easy to installing, dust proof, water proof, flame proof, have low noise and high safety very safe to use. 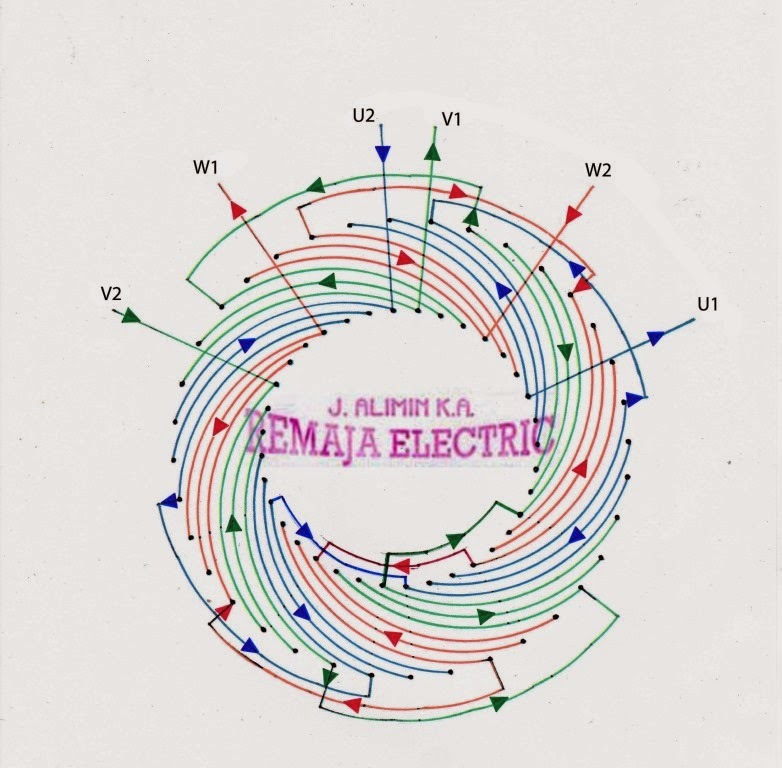 Diagram below will give you a new experience for those who want to learn how to rewinding induction motors in accordance with the following specifications. 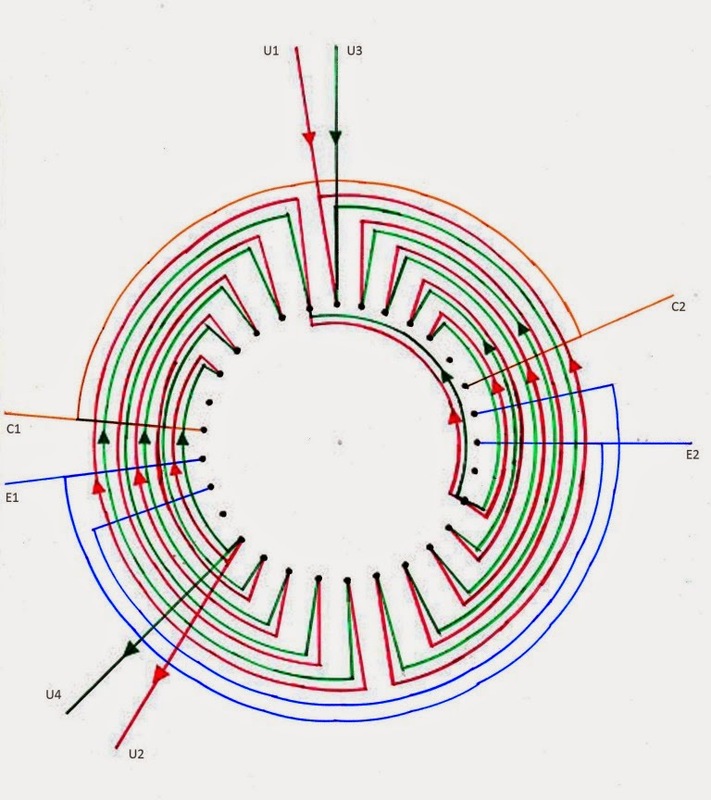 All the coils are in series connection and divided two groups, each groups have three coils, the inner coils span is 7,9 and 11, all of them have same number of turns. 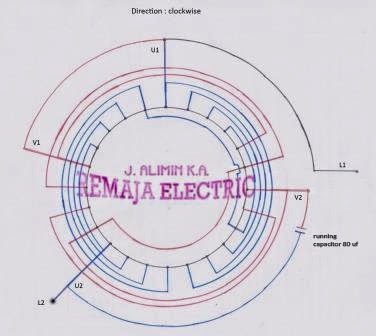 the diagram of winding electrical motors with 3000 rpm in single layer winding, each phase have two groups, for every groups have two coils, all the coils are in series. 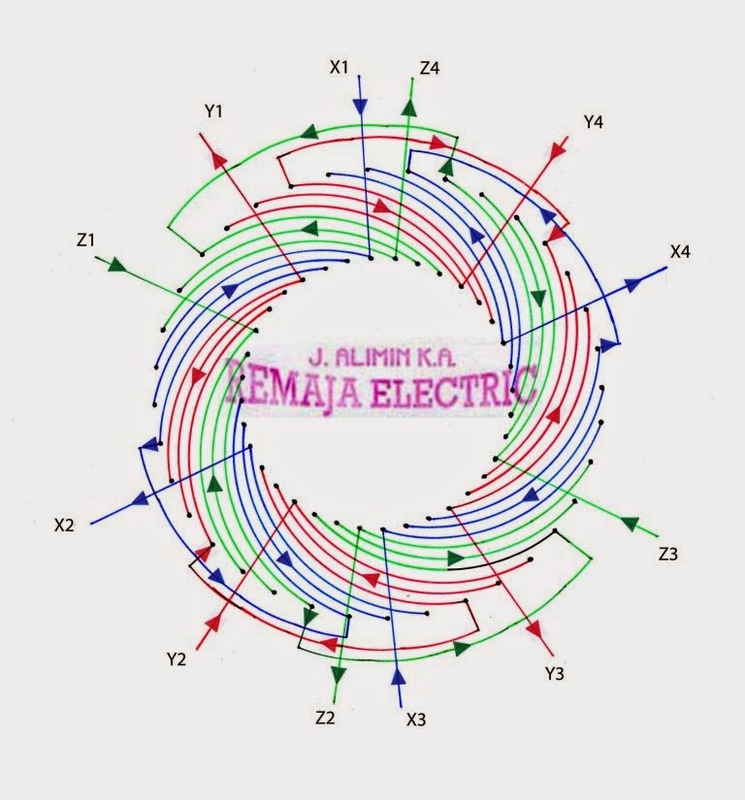 winding diagram, will facilitate the process of learning and observing what steps need to be taken into consideration and what needs to be done when doing induction motor rewinding, from the picture below that we know the speed of rotation, the number of poles, number of slots, coil span, in series or parallel conections, how to determine the direction of motor rotation clockwise or counter clockwise direction. 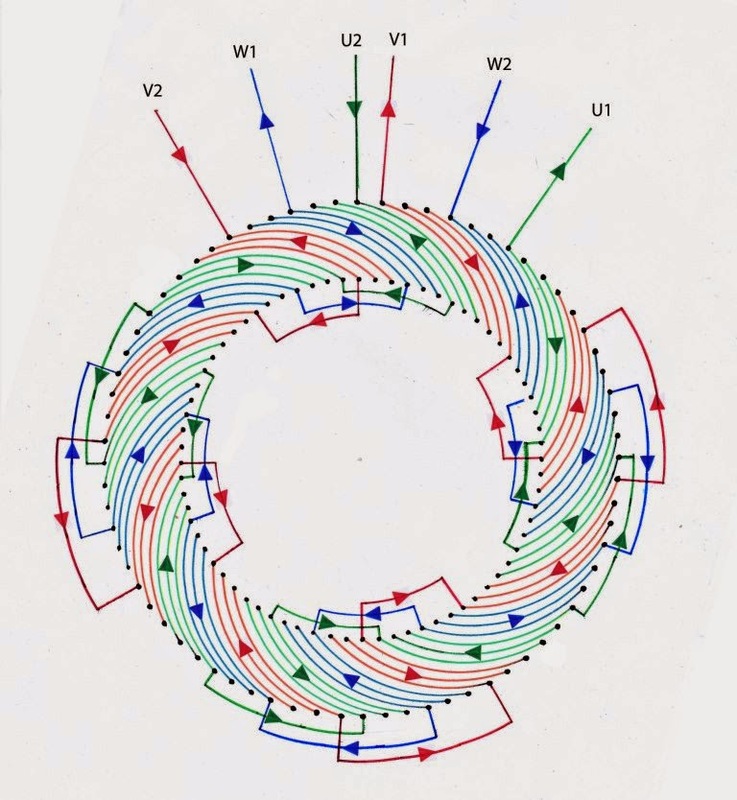 The main coils(blue) have 4 coils in each groups and divided into two groups, between the goups are in series.